← Does the Greek Bailout Pave the Way for the United States Of Europe? All of us alive today are both blighted and blessed. Never before, in human history, have we faced such threats (WWIII, global economic, environmental and societal collapse etc.) but never before have we had access to almost limitless information and analysis (both good and bad) and the ability to communicate as a global family of human beings. We aren’t “consumers”, defined by ideology, race, ethnicity or culture but genetically related human beings and we are presented with a unique opportunity to transform humanity and the planet. How did they get their power and how is it used? How do we distribute power for the benefit of all human beings and the planet? Who rules? – The Structural Elite (SE) comprised of banking and industrial dynasties, European royalty, those in charge of the “military industrial – media academic complex” (MIMAC), political and economic predators and the super-rich. Fig. 1. above describes how the world works as a system. The Structural Elite (SE) are beneficiaries and architects of this system which has evolved over centuries. The SE exercise the principal levers of power to foment competition, division, conflict and oppression while preying on humans and the planet to extract yet more wealth (from debt interest, taxes and rents) and power. The SE are where they are, and think the way they think, because they are products and components of this system, as are most people. Our world view is carefully shaped through education and media (two important levers of power controlled by the SE) to ensure our compliance to the overarching system. Wars, Oppression and Division ensure power and wealth, created by the 7 billion people on the earth, accumulate in the hands of the SE. It is a self-protecting system in which everyone is incentivised to maintain the dominant power of the SE, irrespective of battles between nations, cultures, left and right, home owners and renters, employed and unemployed, old and young, etc. Fear, greed, distraction and competition ensure our compliance within a system which drives inequality, wars, oppression and environmental destruction. The levers of power are cloaked in dogma and ideology to obscure their self-evident abusive and destructive nature. 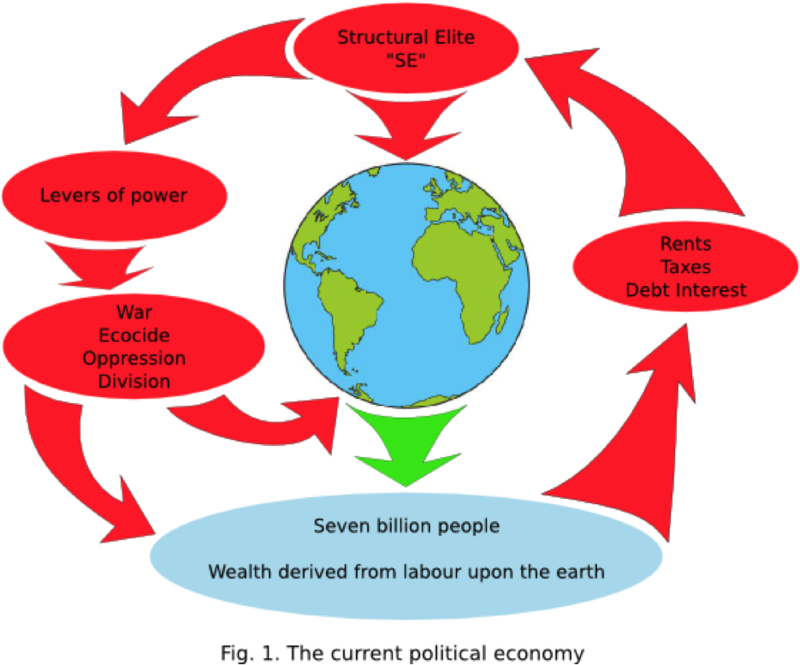 How did the Structural Elite (SE) get their power? – power and wealth are synonymous. They derive their power from, and exercise it through, the political economy (a term expunged from academic discourse for the last century or more). Flaw 1. Originally seized by conquest and criminal confiscation, land has been appropriated through a legal system which evolved to benefit the SE. Land is God – or nature – given and “belongs” to no-one but we all, by virtue of existence, have a right to access its fruits and amenities along with the responsibility to preserve or improve it for future generations. The value of land isn’t created by the owner but by the whole community (local and beyond) and publicly funded infrastructure and yet this value, created by others, goes into the landowners’ pockets – it is a legalised (by the SE‘s law) form of theft. The same applies to resources which come from the land and from knowledge which is communally created and is built upon the accumulated wisdom of all human beings who’ve lived on this planet. Other commons are genes, the radio spectrum and landing slots at airports. In the case of the latter, the value is created by passengers and all those contributing to the amenity of the airport. Corporations own patents on seeds and natural remedies, denying humans their birthright. Flaw 2. Money is created from nothing by banks and lent at interest – banks create no wealth in this process but extract wealth, created by other peoples’ labour upon the earth, in the form of interest, many times the value of money lent – another form of legalised theft. Banks have fostered the need for loans to governments (eg. For climate change), businesses, students, house owners and consumers to enslave the world in debt. Renting money that they’ve created from nothing. Interest on money is a corrosive, abusive driver of inequality and environmental destruction (Ecocide). It underpins this economic system which demands exponential growth. Economists say 3% GDP growth for a “developed” nation is desirable. That means doubling the economy every 24 years which means double the waste and extracting resources at twice the rate. It is unsustainable. What is also unsustainable is the payment of interest on debt which grows faster than the ability to pay it. It’s obvious, only the amount lent is created but where does the interest come from? From the creation of more debt as money. Collapse of the economy, when debt becomes unsustainable, is inevitable. Interest drives inequality because those with money exploit those who need it. A study showed that the bottom 80% of people, by income, pay twice as much interest as they receive but the top 10% receive twice as much interest as they pay, ie. the bottom 80% pay all their interest to the top 10 %. And it gets worse, the top 0.1% receive 2,000 times the top 10%. Inequality is built into the interest on money system. Those at the top, didn’t create the wealth they enjoy but either inherited it or exploited the economic system successfully. Incentives abound to accumulate as much money as possible and the most successful in exploiting the system dominate. And the more they have, the more they get, irrespective of merit. Flaw 3. In addition to SE control of land (and resources) and money, there is a third flaw in this economic system: the means to life is conditional on paid employment. In pre-industrial times, before enclosures and colonisation excluded indigenous peoples from the land and resources, everyone had the means to house, clothe and feed themselves. Even as civilisations developed, communal living and working was the norm but at some point hierarchies developed, in which the powerful would exploit the labour of the majority through slavery, feudalism and eventually the current brand of capitalism. The industrial revolution drove people from the land into factories and the ideology of the protestant work ethic was born. To survive and be valued as a human being, you need a job yet phenomenal productivity gains over the last few centuries mean there are nowhere near enough good jobs to go round. Destructive, abusive and faux jobs (with no meaning or value) have evolved in a vain attempt to create “full employment”. Full employment is not achievable, necessary or desirable. People don’t need jobs, they need income. If people had enough unconditional income to house, clothe and feed themselves, they wouldn’t be so powerless and could participate more in local, national and global activity and decision making. These three economic flaws provide the wealth to control the levers of power. Fig. 2. comes from a 2011 study, published in the New Scientist, which revealed 147 corporations control 40% of the network of 43,060 transnational corporations and 60% of their revenues. 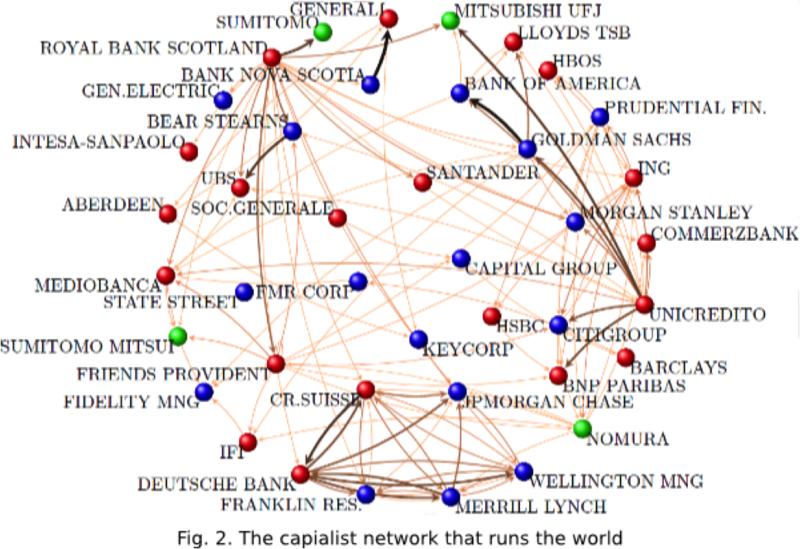 The data were derived from common directorships and shareholder registers but the study didn’t explore the beneficial ownership of these 147 banks and corporations (45 of the top 50 are financial companies). Owners hide behind offshore companies, trusts and foundations and research suggests ownership is concentrated among the SE. This concentrated economic power grants the SE control of banking and finance, politics, the “military industrial – media academic complex” (MIMAC), the law, think-tanks and NGOs to shape our world view. Our beliefs have been co-opted to enslave us. This is why the time for Critical Thinking is now – its time has come and if we don’t apply it, our civilisation is doomed. It’s time to open your mind, shed ideology, turn off your TV and radio, cancel your newspapers and seek information from trusted sources or be selective and cross-check everything. It takes time but it is more stimulating than a detective story and more empowering than a banker’s bonus! How do we distribute power for the benefit of all human beings and the planet? – Critical Thinking. We’ve answered the first two questions above but the answer to the third is not yet complete. Nonetheless, we believe we are in sight of a solution and Critical Thinking itself is the test bed for the final piece to complete it. Collaboration is the key to solving our problems. Critical Thinking’s research and analysis have been conducted over three years by a group of individuals in London, interacting with many individuals and groups worldwide, to synthesise relevant accumulated knowledge, wisdom and understanding into a unified theory of political economy. It’s not claimed to be comparable to such a theory in science but most of the major threats in the world can be interpreted through the theory expressed in Fig. 1. Critical Thinking’s analysis is based on millions of man hours of work and thought by human beings since the birth of civilisations but no one individual or group can claim authorship or copyright over this accumulated knowledge. Like the land and resources, it belongs to us all and future generations – that is why freedom of the internet is essential for our survival. We need to suppress our egos and think of the common good. If we look after everyone else and the planet, we will be looked after. We are a complex interdependent ecosystem and co-operation is the key, not just to our survival but to transformation from a competitive world of scarcity into a co-operative, global community living in a world of abundance. Contrary to popular belief, our default inclination is to co-operate but the abusive political economy dictates that to survive, you must compete. One form of competition is dialectics, the competition of ideas which is how politics are typically conducted. It is a war of competing ideologies which serves the interests of the SE, not those of the people. Politicians are puppets of the SE, acting out their respective roles in a bizarre, complex, evolving theatre production. We cannot rely on leaders to deliver durable solutions for humanity, we need to develop solutions locally, regionally, nationally and globally, people to people. Nor can we expect leaders to relinquish power without the recognition that it’s in their long term interest; we have to develop a vision for an alternative non-hierarchical political economy. How culpable are the SE? While some of their ancestors may be the original architects of the political economy, which has since evolved for their increasing benefit, many inherited their position – they are products of the system and their world view has been crafted to convince them of their right to rule. Thus scions of political, banking and industrial dynasties and European royalty are in some senses victims, as well as beneficiaries, of the political economy. They think the way they do because they’ve been brainwashed from birth with a sense of entitlement, superiority and responsibility – they perceive it as their duty to rule. Their numbers are augmented by members of the military industrial – media academic complex (MIMAC), political and economic predators and the super-rich, all of whom have successfully exploited the system to arrive “at the top table”. There is evidence to suggest some of the SE have psychopathic tendencies but irrespective, they have insufficient empathy with the billions who suffer the consequences of their geopolitical machinations to stop. Their lack of empathy is a product of their world view. Seeking to punish the SE is counter-productive; if transition to an alternative political economy requires retribution for their crimes, the SE will resist such a transformation using all the powerful levers of power at their disposal. The challenge is to demonstrate how they benefit from relinquishing their power. The SE have their own fears which relate to their loss of power and wealth. In a competitive world of scarcity such fears are wholly rational and justified. In a co-operative world of abundance, such fears will evaporate. We need to choose: retribution or truth and reconciliation. The value of land, resources and other commons (such as water, the radio spectrum, genes, nature and knowledge) cannot be appropriated by individuals, corporations or governments; they are gifts from the universe or are communally created. The value of these must be shared for the good of all to fund public services and an unconditional citizens dividend. Debt must be unenforceable in law and usury (lending money at interest) illegal. Debt must revert to a social construct rather than a mechanism for wealth extraction, exploitation and oppression. The Means to Life cannot be conditional on paid employment but is a right for all and must be provided in the form of an unconditional citizens dividend sufficient for a decent life. To implement these principles, we need to develop systems of organisations to devolve power to the people. There is a lot of material to draw on and Critical Thinking is engaged in exploring and developing non-hierarchical (political) organisations. There is much to learn from other civilisations, nations and cultures both past and present. Preliminary ideas have evolved but there is much more work to be done. Fig. 3. is a work-in-progess. The political economy must be founded on the three economic principles but also needs to reflect the cultural and social realities of each country/region. We are keen to engage with others, around the world, working on similar ideas, to accelerate our understanding and develop a vision for local, national, regional and global non-hierarchical structures to manage human activity in harmony with nature while taking full advantage of technology and scientific advances, to benefit both humans and nature.